Hot, humid and sticky weather is almost upon us (and for some that's all you have in terms of climate) and the urge to wear less makeup and let the skin breath and glow will be coming on stronger. In cases like this I love to wear cream blushes because they give a light flushed look to the cheek and apply just the right amount of pigmentation to your face. Cream blushers also give you a natural looking radiance that looks like its exuding from within. Also if you are daring and want to have added drama on the cheek applying cream blush and a powder blush on top of it applies more pigmentation to the face and makes blushes last a lot longer too! If you have oily skin have no fear, just make sure you powder you face in the t-zone to avoid looking like a coloured grease ball. I know some ladies are afraid of cream blush because it appears to be a pain to put on and some question the pigmentation of them (especially if you have tanned to dark skin) but the facts are cream blushes tend to be the most pigmented out of all blushes on the market and can be layered to achieve the desired look easily. Add a high lighter and top and enjoy the glowy divaness! I'm going to show you my favourite cream blushes I have purchased over the years. 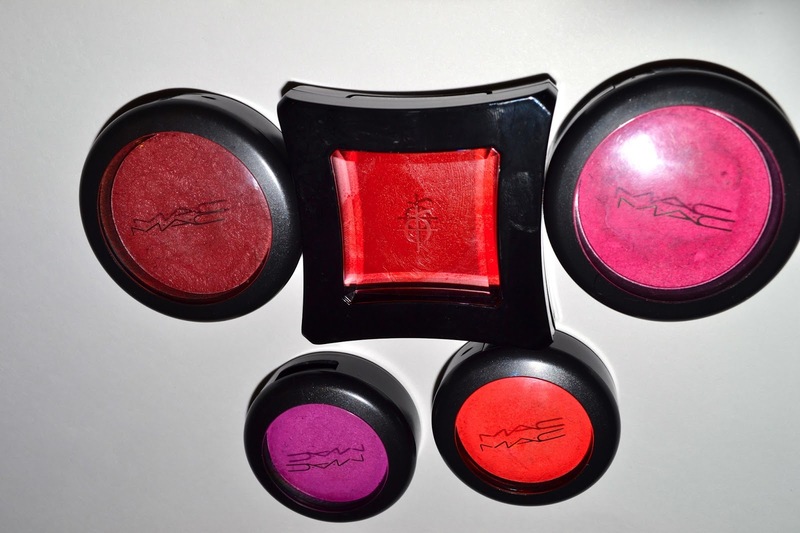 MAC's-Florida: A cream blend blush that is is a light fuchsia pink. It has blue undertones so would look perfect on tanned to dark skin tones. The pigmentation on this blush is extreme so be careful with application. MAC's-Virgin isle: Is a coral orange and is very pigmented. It may look scary in the pan but placed on cheeks it provides a gorgeous glow especially on darker skin. Again careful application is needed and best with fingers. MAC's- Madly Magenta: Is a beautiful fuchsia/Magenta purple that stunning on the cheeks. It is pigmented as well so a little goes a long way. Illamasqua- Brazen: Is a bright blood red blusher that is super pigmented. A very little goes a long way. Don't be afraid of the color! On lighter skin tones it gives a nice flush when used moderately and on darker skin provides a beautiful color to cheeks. MAC's- Laid Back: Is a deep brick red. It is my favourite out of the bunch because on my skin tone looks very natural and gives a natural dewy appearance. Mac had discontinued some of their cream blushes and re-release in collections but a few that I would like to check out are NYX (heard nothing but good things about them), more Illamasqua, Make up Forever, and NARS.